The Jerusalem Police stormed the Temple Mount Monday morning and locked Arab rioters inside the Al Aqsa Mosque. The police had gathered intelligence about Arab youths who had spent the night at the Temple Mount compound. The youths had collected rocks and fireworks and prepared firebombs, which they stored inside the Al Aqsa Mosque in order to use them against police and interfere with non-Muslim visits to the Mount. In addition, they created obstacles to prevent the closing of the last open door into Al Aqsa. These included shoe cabinets that were nailed onto the mosque doors, iron bars, wooden planks and a barbed wire fence, also connected to the doors to prevent them from closing. They also created obstacles from wood and netting, to hide behind as they threw rocks and fireworks. These actions indicated the youths’ intention to prevent police from locking the door by attacking them with rocks, fireworks and firebombs while hiding behind the shelters. Immediately after the morning prayer, several Muslims were seen strenghtening the obstacles at the entrance to the mosque, their faces covered. 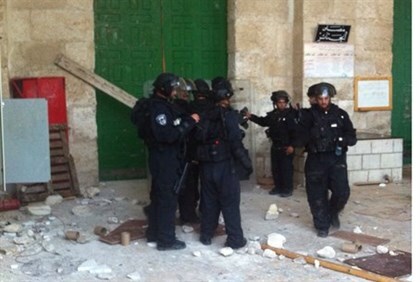 A large police force under District Commander Yossi Parienti entered the compound and surprised the youths, who enetered the Al Aqsa mosque, hid behind their shelters and began throwing their improvised weapons at police. The police force fought them off and succeeded within a short time in removing the obstacles and closing the mosque’s doors on the rioters. The Temple Mount was scheduled to be open to visitors at 7:30 a.m., as planned. Speaking to Arutz Sheva, the rabbi argued that the Arab rioters are intentionally trying to prevent Jews from reaching the site on Sukkot, one of the three Jewish pilgrimage holidays that in ancient times required Jews to travel to the Temple in Jerusalem. Beware of your false Prophets and false teachers here ?